I’m on a comfort music kick. Comfort music is different for everybody, but in the context of Swole Ear, it must meet a few requirements. I want records that are easy to listen to, easy to analyze, and aren’t too far over the 40-minute mark. For me, “easy to listen to” usually refers to standard indie rock bands. See The Hold Steady, The National, The Thermals, etc. So by all means, if you know of any records that meet these criteria, hit me up at Swole.Ear@gmail.com. Send any other suggestions there if you want, as I’m sure I’ll be off this kick fairly soon. So, for the time being, Okkervil River satisfied this comfort music craving quite well. They’re about as standard as a folk-rock band can get, and that’s just what I need. 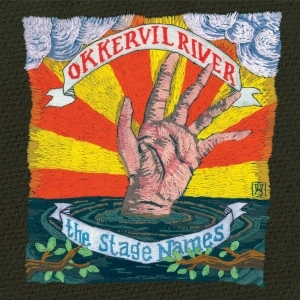 Okkervil River reminds me of a few of bands that I love, from Wilco to The Decemberists, with touches of Bright Eyes, and even lyrical bits that wouldn’t sound out of place in a The Hold Steady song. This band is essentially a melting pot of awesome, and I loved nearly every minute of their 2007 release, Stage Names. Front man Will Sheff is the reason that I was so quick to attach myself to this record. He’s one clever dude, and upon this first listen, his lyrics come off as extremely insightful. I’m sure there’s a lot that I missed, but his frequent references to indie music, and even other songs from the same album won me over right away. He’s also got a decent voice. I forget that those can be pleasant to listen to every now and then.